Seeing your loved one struggling with an addiction is very difficult for not only you but everyone else around you, including the individual who is addicted. Assuring that your loved one who is struggling with an addiction is the first step, but then for everyone who may be involved in their lives to also seek support. Family therapy can be beneficial for everyone so everyone can understand the addiction and identify ways to help and support. 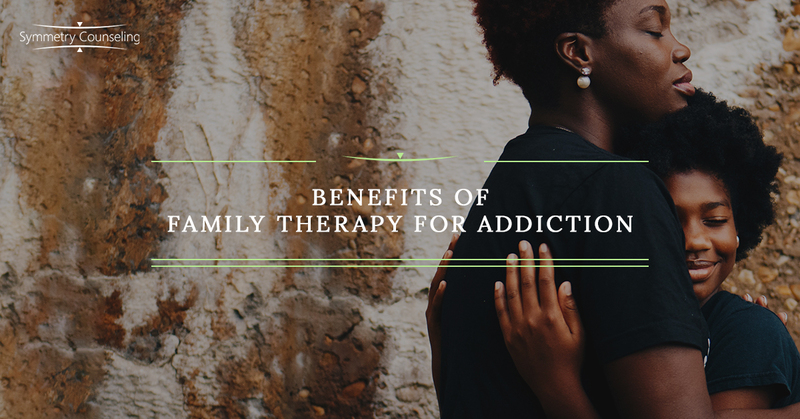 This blog will identify reasons why family therapy is beneficial for the treatment process for an addicted individual. 1. Understanding the reasoning behind the addiction along with understanding how it affects the individual. Without knowing the cause of the addiction or how it impacts the body it can be difficult to understand why your loved one is struggling. A therapist can help expand on the information of how addiction occurs and what is the best way to help them. Families are encouraged to discover new opportunities while also identifying their own self-awareness and insight. 2. Being aware of the family dynamics. Depending on the addiction, sometimes it can be heredity. Addiction can also be caused by watching your elders (or even youngsters) engage in a certain behavior and then the individual themselves starts too. Families sometimes engage in negative coping skills and being able to identify positive coping skills is fundamental. When engaging with your loved one who is struggling with an addiction, being cautious in how you state things revolving around their addiction is crucial. Being able to communicate with them openly but non-judgmentally is necessary. Be there for your loved one and help them understand that they are not alone in this journey. When we are discussing the addiction, being mindful of how we are feeling. If you are feeling angry, be sure to express those emotions. If you are feeling emotionally drained from helping them, tell them. If you are feeling grateful for the progress they have made, celebrate with them. When helping your loved one through their addiction to either stop completely or taper off, you need to set proper boundaries with them. For example, if they are suffering from an alcohol addiction, and you are enjoying a glass of wine, be open with them to express what your expectations are from them. When your loved one is going through their addiction, trust can be ruptured. Being able to support them and understand where they are coming from. Rebuild your trust with them to help them. Remember what your ultimate goal is for them. Having positive communication and honest interactions can result in positive changes. There might be people in the family that are unwilling to be supportive or to engage in family therapy. That is okay. If therareis at least 2 people in the session, then that is better than nothing. Of course, including everyone is ideal, but it may not always be the key. Do not force anyone to go to therapy for their addiction or to understand the addiction, but to refocus on what the reasoning behind attending therapy is for. In addition to family therapy, attending groups such a Al-Anon, Nar-Anon or even SMART Recovery can be advantageous. If you or someone you know is suffering with an addiction, feel free to reach out to our talented psychotherapists at Symmetry Counseling. We offer individual therapy, couples therapy, and family therapy.